Advanced stats show the Patriots only use Gronkowski when they have to — but when they do, he’s still Gronk. In his two-year stint on television, CBS color commentator and former Dallas Cowboys quarterback Tony Romo has received all sorts of praise for his ability to anticipate play calls. It’s justifiable—he’s great at it. He read defenses and measured tendencies for 10 seasons as the Cowboys’ starter; it’s what he was born to do. Sometimes it’s pretty easy, though. Are the Patriots playing? Is it a key pass play in a high-pressure moment? Then yeah, the ball’s probably going to Rob Gronkowski. 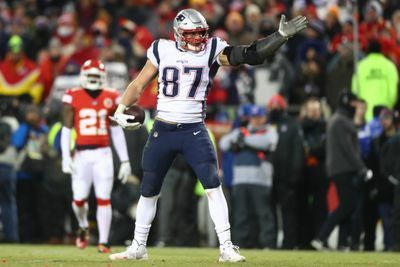 The box score says Gronk had a solid day at the office in Sunday evening’s AFC Championship win at Kansas City: he caught six of 11 passes for 79 yards and outplayed the Chiefs’ Travis Kelce (3-for-5 for 23) — maybe the best tight end in the league. That doesn’t tell the whole story, though, does it? On passing downs (second-and-8 or more, third-and-5 or more), the 29-year old former Arizona Wildcat caught four of six balls for 59 yards. He set up a go-ahead score in the final minute of regulation with a 25-yard reception on third-and-5, then he set up the game-winning touchdown in overtime with a 15-yarder on third-and-10. In the biggest moments of the biggest game of the season, Tom Brady looked to Gronk first and everyone else second. The Chiefs defended him reasonably well, and it still didn’t matter. Gronk remains Brady’s In-Case-of-Emergency contact — a role in which he has thrived since he entered the league in 2010. According to Pro Football Reference when a game is in the fourth quarter and within seven points, among tight ends in this decade, only Jason Witten has more receiving yards than Gronk. Witten, of course, played with Romo, and the two had far more opportunities to connect in these fourth-and-close scenarios — they weren’t winning nearly as many games easily. As Gronkowski’s body has shown signs of wear and tear (he’s 29 going on 45), the Patriots have attempted to limit his exposure. It’s as if they realize he only has a certain number of snaps and targets left in him, and they need to save them for only the most important moments. Including playoff games, Gronkowski has played in 15 games this season. 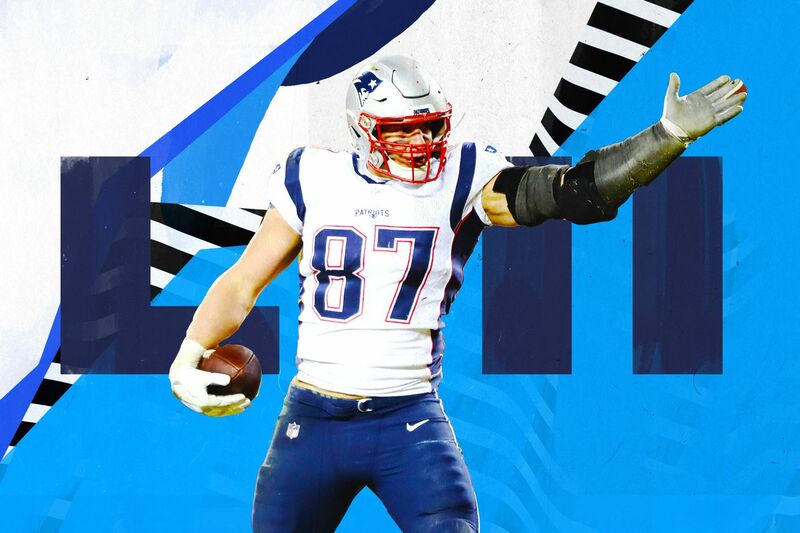 In 10 games decided by more than one possession, Gronk has averaged 4.8 targets, 2.8 catches, and 35.9 yards per game. In the three games preceding New England’s trip to Kansas City — two easy season-ending home wins over the Bills and Jets and the 41-28 victory over the Chargers in the divisional round — he was targeted a total of six times. In five games decided by a single score, however, he’s averaged 7.2 targets, 5.2 catches, and 85.4 yards per game. That’s about the rate he was cranking out during his most high-usage seasons — he averaged 7.8 targets and 82.9 yards during his 2011 breakthrough season, and he averaged 8.7 targets and 74.9 yards in 2014. The Pats don’t use Gronkowski unless they have to, but when they do, he’s still Gronk. There’s a subset of NFL tight ends that you could basically call high-leverage guys. Six players were targeted at least 40 times in the regular season, with a) at least 35 percent of their targets coming inside the opponent’s 40 and b) at least 30 percent of their targets coming on what I define as blitz downs (downs in which NFL teams pass far more often than not — second-and-long or third-and-3 or more, basically). These are guys with particularly hard jobs. Among this group, Gronkowki has the highest success rate, the highest marginal efficiency, the highest marginal explosiveness, and the greatest yards per catch and yards per target. The Patriots are willing to declare their intentions in these situations because it makes you declare yours, too. When Gronk is lined up in the slot, the ball is almost certainly going to either Julian Edelman or James White. Since Edelman’s return from a four-game suspension, he has been targeted with the ball 28 percent of the time (at 6.3 yards per play) when Gronk is in the slot, and White — the check-down option of all check-down options — is targeted 24 percent of the time (5.4 yards per play). If you don’t handle Gronk properly, he’ll get the ball (12 percent, 9.1 yards per play), but if you do, you probably can’t also handle Edelman properly. When Gronk is lined up wide, it’s the same story. The ball goes toward Edelman 24 percent of the time (9.8 yards per play), Gronk 27 percent of the time (9.7), and, if or when you’ve responded properly to those two, White 30 percent of the time (2.9). You want to force Brady to dump the ball to White, but it’s hard. While the Patriots run the ball plenty — Sony Michel, Rex Burkhead, and White averaged 23 carries per game in the regular season and have averaged 38 per game in the playoffs — they play a three-man game when they need yards. And they probably beat you with it, too. So, what can the Rams do to beat them? How the Rams handle this three-man game might dictate the outcome of the Super Bowl. Los Angeles has been excellent in passing situations this season — the Rams are fifth in passing downs marginal efficiency and ninth in passing marginal efficiency. But despite the presence of all-world tackle Aaron Donald, opposing quarterbacks tend to find time to make their reads, and when they beat the Rams in blitz situations, they beat them. Todd Gurley are both 24 years old, leading receivers Robert Woods and Brandin Cooks are 26 and 25, respectively, and at 33, head coach Sean McVay is barely older than Edelman and more than eight years younger than Brady. But the old folks’ ability to simplify and produce in the most important situations has put the Pats in the Super Bowl for an unprecedented ninth time in 18 seasons (and fourth time in the last five). And even if the Rams know where the ball’s going to go — to Gronk, probably, if it’s important — they still have to stop it from going there when it counts.